While the practice of debt collection is a legitimate business, and collectors do have the right to collect on your debts following strict legal guidelines, there are some debt collection agencies that overstep these legalities in outrageous ways. Some debt collectors have been known to pursue consumers through Facebook, illegally impersonate organizations; including police departments and law firms, and even use physical threats of harm to family pets. EGS and it’s subsidiaries operate the largest debt collection service in the world, bringing in $1.2 bill. in revenue. A complaint was filed in Dallas where the Federal Trade Commission (FTC) charged EGS and it’s subsidiaries, operating under the names NCO Group, Transworld Systems, North Shore Agency and ALW Sourcing, with multiple violations of the Fair Debt Collection Practices Act (FDCPA)and the FTC Act including repeated, harassing phone calls and leaving voice mails that could violate the consumer’s confidentiality by stating they owe a debt. The FDCPA bars debt collectors from calling consumers at work, late at night or early the morning. Debt collectors are also barred from revealing details of the debt collection action to people other than the debtor. EGS settled to pay a 3.2 mil. civil penalty to settle a number of charges due to bad credit collection practices. EGS and it’s subsidiaries are barred from any further violations. Goldman Schwartz used scare tactics by posing as a law firm and claiming to work with law enforcement authorities calling consumers incessantly and threatening the consumer with jail time and sending officers to their workplace. There were also allegations of collectors telling consumers that child protective services would be involved and take their children into government custody. The FTC shut down this Texas based debt collector for abusive calls to force people to pay loan debts. RB&A, based in California was charged by the FTC for complaints alleging that they violated multiple illegal debt collection practices including berating customers with obscene language and threatening physical harm. The company even went as far as to threaten to exhume the bodies of debtors’ deceased children and hang them from a tree or drop them outside their door if they failed to pay their funeral bills. RB&A have agreed to a settlement that permanently bans them from debt collection and charges them with $700,000 in civil penalties. In a separate settlement, the FTC also obtained over $400,000 in judgments against three other companies that RB&A controlled, which were alleged to have received funds from the defendants’ activities. Be aware of your rights regarding fair debt collection. 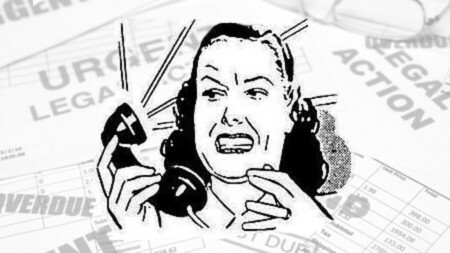 The FTC urges consumers who believe they are being illegally harassed by a debt collector to file a complaint at FTC.gov or by calling 1-877-382-4357.